for the 2019 Strawberry Festival Grand Parade Grand Marshal. How they have enhanced Island life. In what ways have they given back to the community? What is their involvement in community? Let us know any service work they have done or are doing. How long have they lived on Vashon? Why you think they should be Vashon Island’s Grand Marshal. Nominees will be selected by The Sponsors of the Grand Marshal Award (Island Market IGA) and Board Members of the Vashon Chamber of Commerce. Nominations should be submitted to the Chamber of Commerce via letter (PO BOX 1035 Vashon Island WA, 98070) or email by Noon, Wednesday June 19th, 2019. The Grand Marshal will be honored with a special place in the Grand Parade on Saturday July 20th and the Car Parade on Sunday July 21st. Their name will be etched on the Grand Marshals plaque displayed at the Chamber, sewn into the Grand Marshal Sash and they will get to present their favorite Strawberry Festival Grand Parade Participants with the coveted Grand Marshal's Choice Award. 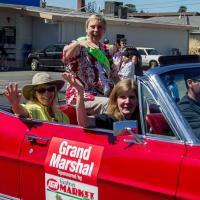 Strawberry Festival Parade Grand Marshal is sponsored by Vashon Island Market IGA.